armadillos.you'd want one? | escaped. The fashion blogosphere has been buzzing about the famous Alexander McQueen's latest creations. I won't lie. 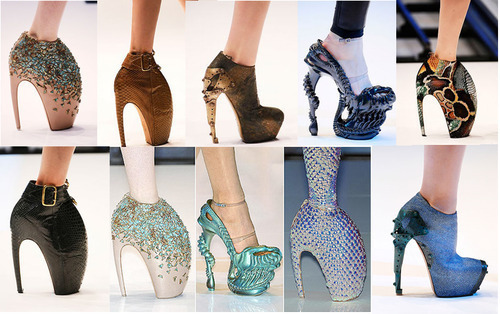 I HATE THOSE HEELS. They're ugly, scary-looking, make you look like your ancestors are aliens, not to mention impractical. I don't care if they're on Lady Gaga's Bad Romance video, she's probably the only woman who can actually pull it off. Or not. Blergh. This is where I drew the line in the heels department. sape ckp lawa mmgla buta. ade org suke the 'unique'-ness. hahahh thanks for posting it!kesian the models.haha.